Spray 3 1/2- to 4-quart slow cooker with cooking spray. Cook and drain macaroni as directed on package, using minimum cook time. Place macaroni in slow cooker; immediately add butter and stir until melted. Add evaporated milk, half-and-half, 2 1/2 cups of the Cheddar cheese, the cubed cheese, mustard, salt and pepper; stir to blend well. Cover; cook on Low heat setting 2 to 3 hours, stirring once halfway through cooking time. During last 15 minutes of cooking, sprinkle with remaining 1/2 cup Cheddar cheese and the bacon. 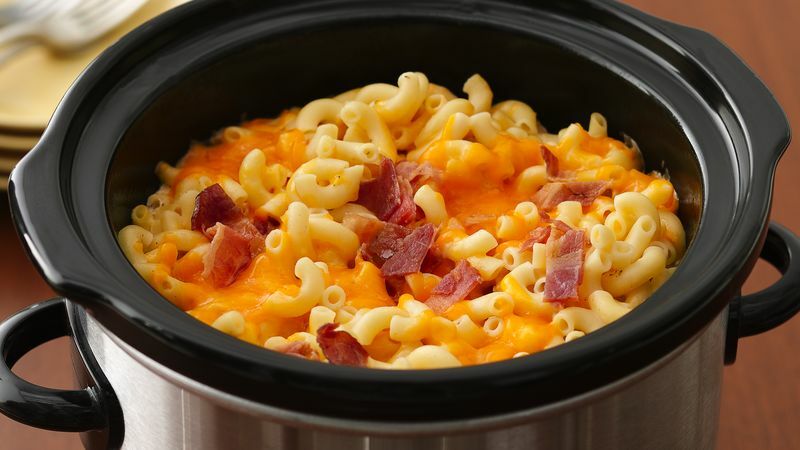 Macaroni and cheese is a great dish for adding herbs and other ingredients to give it a unique or new flavor. For example, during the last few minutes of cooking, stir in about 1/4 to 1/2 cup salsa, cubed ham, caramelized onion or chopped cooked vegetables (such as broccoli or asparagus), or 2 to 3 tablespoons chopped fresh basil or parsley. Packaged precooked bacon is a quick way to get great bacon flavor, but instead, you can cook 8 regular bacon slices until crisp, then drain well and crumble.